The Potteries, an area that is the birthplace of many famous people, Arnold Bennett, Sir Stanley Matthews, Reginald Mitchell, Captain Edward Smith of the Titanic, Josiah Wedgwood, and more recently Robbie Williams...but just as important to the Potteries are our very own Staffordshire Oatcakes. Once only eaten locally the Staffordshire Oatcake has grown steadily in popularity over recent years and as a result we supply both export prepared oatcakes and our easy to use oatcake mixes to oatcake lovers all over the world . As you browse through our site you will see that you can buy our Staffordshire Oatcakes online and also be able to make them for yourselves at home, from a specially prepared Original Oaties Staffordshire Oatcake Mix supplied by us ! Spurred on by the huge worldwide success of our Oatcake Mixes we have developed a method of sending freshly prepared Oatcakes to most destinations in the world. Not by adding preservatives but by developing a method of packing our export prepared oatcakes that can double the normal 4 day shelf life and if refrigerated even triple it. A perfect way for overseas oatcake lovers to indulge. To order yours now, along with a range of oatcake related gifts, using credit card or paypal on a secure server, go to the Staffordshire Oatcakes Online Store. The oatcake is a regional food, typical of north Staffordshire. We are using an original oatcake recipe that had been used at the bakery for years. The present owners have experimented with the oatcake recipe to enhance the taste of the oatcakes as well as their texture and appearance and the oatcake recipe now used is believed to make the ideal oatcake. Order oatcakes online or by mail order, for first class post or courier delivery. 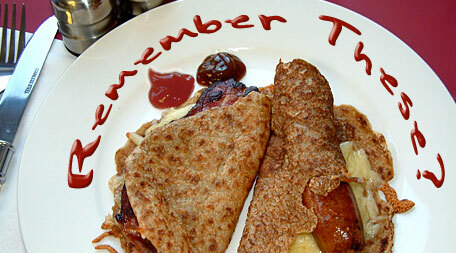 The Staffordshire Oatcake, a regional delicacy, is exclusive to the Potteries area of Staffordshire. In the past our oat cakes were only available to buy from the bakery. But now anyone can enjoy Staffordshire oatcakes, because we have introduced a mail order service,which means that you can order your oatcakes online and have them delivered to you by courier or first class post. 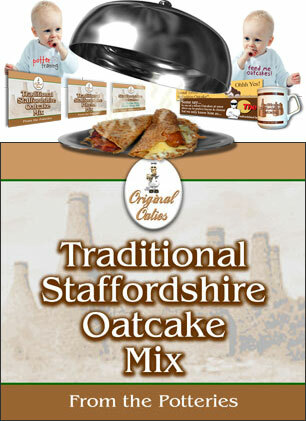 Buy oatcakes online from Staffordshire oatcakes, and have a taste of the Potteries, north Staffordshire, delivered direct to your door. Oatcake recipes Staffordshire oatcakes are similar to a pancake, but are made from white flour, oatmeal and yeast. Oatcake bakers have their own closely guarded recipes. The oatcake, typical of the Potteries area of Stoke on Trent, has to be one of the most versatile food products on the market. Oatcakes make a great alternative to bread at breakfast time, and as well as being delicious as a savoury dish, oatcakes make a great sweet dish. Staffordshire oatcakes - a regional delicacy from north Staffordshire. Oatcakes are a quality high fibre food.